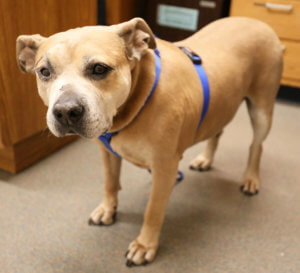 Sadie Sue, the 10-year-old mixed-breed dog, is a lovable patient at the Purdue University Veterinary Teaching Hospital. “If you need something done on Sadie Sue, just rub her belly. It’s her kryptonite,” said Kayla Winchester, RVT, radiation oncology technician at the Purdue University Veterinary Teaching Hospital (VTH). 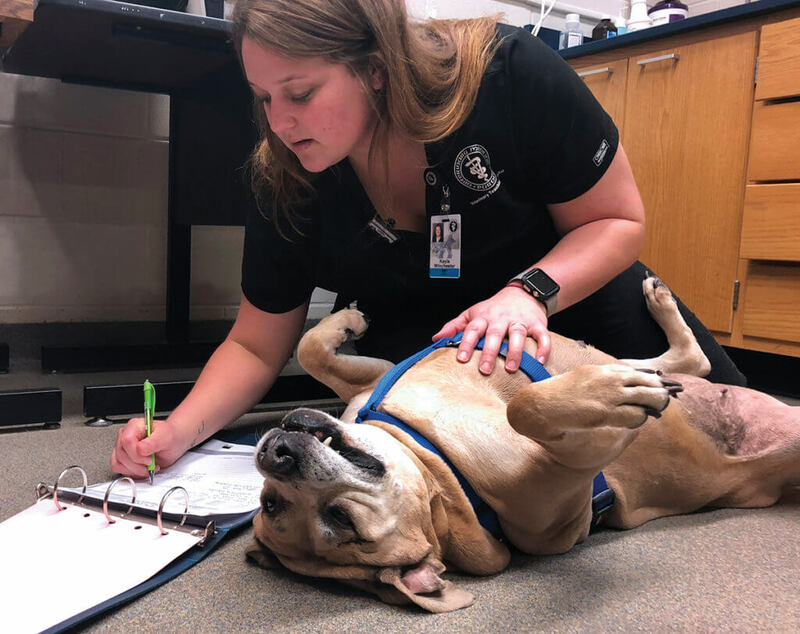 Sadie Sue, a cheerful ten-year-old mixed-breed dog, prefers to be examined while lying flat on her back, which earns her plenty of belly rubs while she undergoes treatment for cancer. Sadie Sue was adopted by Joe Nickerson and Mary Fielding of Greencastle, Ind. in January 2013. In August 2014, she was referred to the VTH because of squamous cell carcinoma in her upper jaw. Radiation Oncology Technician Kayla Winchester, RVT writes on Sadie Sue’s chart while Sadie expectantly lays on her back, waiting for attention. Radiation therapy is a type of cancer treatment that uses rays of intense energy to kill cancer cells. The goals depend on the location, extent, and type of cancer being treated. Clients whose pets have advanced or invasive cancer may opt for palliative radiation therapy to shrink or stabilize the cancer with minimal side effects. In patients with less advanced disease, radiation therapy can be used with a curative approach either alone or to eliminate microscopic cancer following surgery. The VTH radiation oncology team treats cancer with conformal radiation, utilizing a method called Intensity Modulated Radiation Therapy (IMRT). With IMRT, radiation dose is maximized in the tumor, and minimized in important nearby structures like the eyes, brain, or spinal cord. Patients with multiple cancer sites can receive treatment at more than one site in the same treatment plan. Traditional radiation techniques delivered doses of radiation to a less specific area, which often led to unwanted side effects. According to Dr. Plantenga, lowering doses in surrounding normal tissue by means of IMRT results in a tremendous reduction in unwanted side effects for the patient. 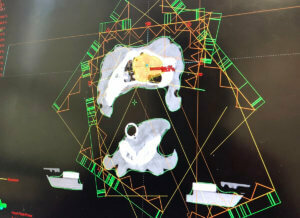 This IMRT treatment plan shows the location of Sadie Sue’s tumor and the radiation treatment fields designed to deliver the radiation dose based on location and depth in the body. In 2014, Sadie Sue stayed at the VTH for five days, receiving daily radiation treatment. Afterwards, she was symptom-free and remained so until February 2016, when she developed signs indicating that, as expected, the cancer had returned. Histopathology results confirmed that the cancer was squamous cell carcinoma. Sadie Sue also had a mast cell tumor above her right eye. Since the first round of treatment two years earlier had extended Sadie Sue’s quality of life significantly, her owners opted for additional radiation therapy. The radiation team treated both sites, using IMRT to precisely target the dose of radiation to both tumors at the same time. 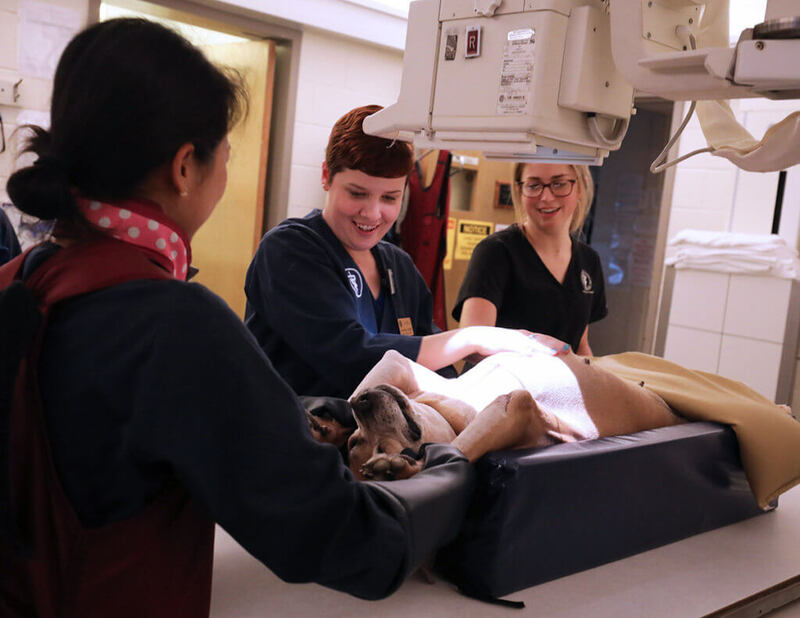 With help from veterinary students (left-right) Michelle Jang and Genevieve Lockerby, and Diagnostic Imaging Technician Brittney Rhodes, RVT, Sadie Sue happily lays on her back for imaging when belly rubs are involved. Walking through the hospital, it seems like everyone knows Sadie Sue. Because she is seen by a number of clinical teams, including diagnostic imaging, anesthesiology, ophthalmology, and soft tissue surgery, Sadie Sue has become well-known throughout the course of her treatment, and is happy to consent to belly rubs from veterinarians and veterinary nurses.